Many people in Thoroughbred breeding believe that pedigree is everything. While there have been many fashionably bred colts and fillies that did not live up to their exulted ancestors on the race track, some did become wonderful progenitors when sent to a breeding career. Courtly Dee is a prime example of this. 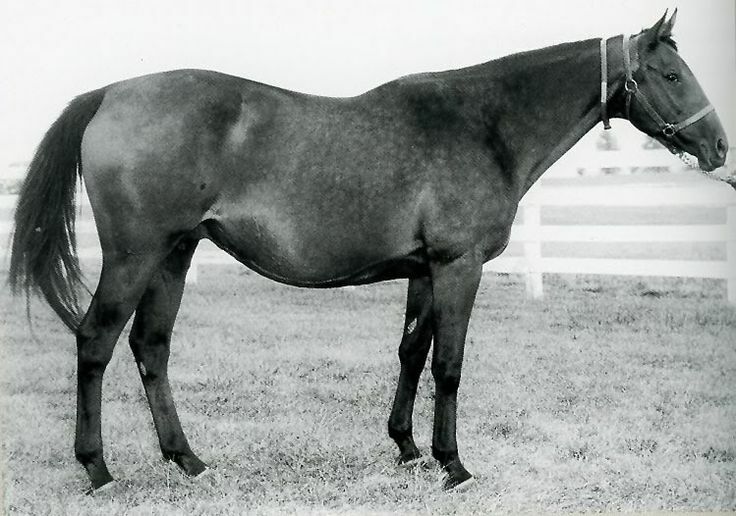 Bred in 1968 by Donald Unger, Courtly Dee was sired by Never Bend, the 1962 champion two year old son from the last crop of the great sire Nasrullah. Never Bend was a headstrong sort, but atypical to the Nasrullah tribe, he was also very fast and athletic. His pedigree was a wonderful mixture of top bloodlines emanating from France, England and the US. Never Bend stood stud at Spendthrift Farm in Kentucky. He had a very prominent thirteen year career as a sire with his most famous offspring being the great Mill Reef from the same crop as Courtly Dee. Mill Reef is acclaimed as one of the top ten Thoroughbreds in Europe in the twentieth century. Never Bend is also the sire of another top calibre race horse and stallion in French 2000 Guineas winner Riverman. As further proof to Never Bend’s sire prowess champion J.O. Tobin and multi stakes winners and successful sires Triple Bend, Distinctive, Proudest Roman, Full Out and Iron Ruler are also among his sixty-one stakes winners (16.5%) from three hundred and seventy total foals. He is the broodmare sire of one hundred and fifteen stakes winners. Two of his daughters were honoured as Broodmare of the Year in the US, Anne Campbell (dam of Menifee and Desert Wine) and our subject for this article Courtly Dee. The dam of Courtly Dee is Tulle by Triple Crown winner War Admiral. Tulle’s dam Judy-Rea brings in the blood of the good stayer Son-In-Law as she is by his son Beau Pere. The third dam of Courtly Dee is Betty Derr, a daughter of twelve time leading broodmare sire Sir Gallahad III. Betty Derr produced Iron Maiden from a cover by War Admiral, who became the dam of Kentucky Derby winner Iron Liege. Iron Maiden also produced Iron Reward by Beau Pere, the dam of another Kentucky Derby winner, the great Swaps. So with a wealth of closely related top notch stakes winners in Courtly Dee’s family and sired by a first rate stallion from a prominent line, there was great hope for her to be a good one on the track. She was an attractive well conformed dark brown filly. Courtly Dee inherited her looks from her sire and also his nervous temperament as well. She had issues in the paddock before her races, becoming a washy mess, and subsequently left a lot of her energy there before her races. Courtly Dee won only four races from thirty-three career starts, adding four seconds and three third places to her totals. None of these races were stakes events. In fact she had run in some claiming races and when she was four years old was actually haltered for $15,000 by Marty Fallon. She won the race, her last victory, and then ran three times for Fallon, failing to win. Fallon sold her to the partnership of Lee Eaton and Marvin Waldman, who retired her for breeding. Eaton and Waldman bought her solely on her pedigree. They felt that even though Courtly Dee did not cover herself in glory on the track, her bloodlines and conformation would be adequate enough to make her a good broodmare. As it turned out, they were so right. She would eventually have eighteen foals, seven of which were bred by Eaton and Waldman, before they sold her in foal to Alydar at the 1980 Keeneland November mixed sale. The partnership of Helen Groves, Helen Alexander and David Aykroyd purchased the daughter of Never Bend for $900,000. While under the ownership of Eaton and Waldman, Courtly Dee had three stakes winners from her seven foals she produced for them. Her first foal was G1 Sapling Stakes winner Ali Oop by Al Hattab. The grey also won the Dragon Stakes at two and the Boardwalk Stakes at three. Al Hattab was a multi stakes winner (Jersey Derby, Fountain of Youth Stakes etc) and successful sire by The Axe II. The latter won such prestigious races as the Canadian International, Man O’ War Stakes and San Luis Rey Handicap. The Axe II was a son of the great sire Mahmoud and was key in continuing the tail male line for a generation or two, however Ali Oop did not become a success at stud. Second foal from Courtly Dee was Native Courier by Exclusive Native. Although he did not win a grade one like his older half brother, Native Courier did win more stakes and earned more money on the track. His biggest win was the G3 Bernard Baruch Handicap which he won twice. He also scored in the G3 Seneca Handicap, Brighton Beach Handicap and the Laurel Turf Cup. Native Courier was a gelding, so he did not contribute to his dam’s legacy further. Next on the list in order from our heroine was the filly Vireo and her full brother Ragtime Knight by True Knight. Ragtime Knight was a modest winning gelding of five races in fifty-one starts. Vireo won only one race from fifteen starts but as a broodmare produced stakes placed Rush For Gold by the Nasrullah line sire Quack. Rush For Gold was then sent to Australia where she became the dam of STC Magic Night Stakes winner Precious Glitter by Danehill. Another daughter of Vireo was Mistress True, winner of the Maryland Million Distaff Handicap. The next three foals from Courtly Dee were all daughters. Princess Oola, a full sister to Ali Oop, was a stakes winner and became the dam of Sydney Cup winner Azzaam by Chief’s Crown. Courtly Dee’s unraced daughter Foreign Courier by the great Sir Ivor produced stakes winner Yousefia by Danzig, who in turn is the dam of G3 stakes winner Mythical Girl and the second dam of G2 stakes winner Dark Shadow. A full brother to Yousefia produced by Foreign Courier however has become one of the more influential sires of the past thirty years. Green Desert was a top class sprinter on the track (G1 July Cup) and then from Nunnery Stud in Norfolk England, he sired one hundred and two stakes winners. Among his very best are Sheikh Albadou (Breeder’s Cup Sprint, Nunthorpe Stakes, Haydock Sprint Cup), Owinington (July Cup), Oriental Express (Queen Elizabeth II Cup), Desert Prince (Irish 2000 Guineas, Prix du Moulin, Queen Elizabeth II Stakes), Bint Allayl (Cartier Champion Two Year Old), Rose Gypsy (Poule d’Essai des Pouliches), Cape Cross (Lockinge Stakes), Invincible Spirit (Haydock Sprint Cup), and Oasis Dream (July Cup, Middle Park Stakes, Nunthorpe Stakes). The latter three from this abbreviated list have continued the Green Desert branch of the Northern Dancer/Danzig tail male line with distinction and class. Among the best from these sons of Green Desert are Ouija Board, Sea The Stars and Golden Horn all by Cape Cross. Lawman, Charm Spirit, Kingman and Moonlight Cloud are by Invincible Spirit. Sired by Oasis Dream are the likes of Midday, Muhaarar, Power and Aqlaam. The next foal from Courtly Dee, and the last one for the Eaton and Waldman team, was Embellished, sired by Seattle Slew. A winner of one race from nine lifetime starts, Embellished is the dam of Seattle Dawn (Delaware Handicap, Snow Goose Handicap) and stakes winners Island Of Silver and Truckee. Seattle Dawn did her bit to add to the family fortunes by producing Golden Rod Stakes winner Gold Sunrise. After Courtly Dee had her filly Embellished, she was then bred to Alydar and sold later that year. For her new interests of mother and daughter Helen Groves and Helen Alexander, and David Aykroyd, Courtly Dee produced her best race horse. Althea was a rich coloured chestnut filly who would become the 1983 Eclipse Award Champion two year old. She captured four grade one wins that year including the Hollywood Starlet Stakes, Del Mar Debutante, Hollywood Juvenile Championship and the Del Mar Futurity. In the latter two races she beat the boys. Althea followed up the next year with wins in the Arkansas Derby, Santa Susana Stakes and the Las Virgenes Stakes. Her racing career was cut short after being unplaced as the favourite in the Kentucky Derby, by an injury. As a broodmare Althea produced her own champion two year old filly in Yamanin Paradise (Hanshin Sansai Himba Stakes) by Danzig, who in turn is the dam of stakes winner Yamanin Seraphim by Sunday Silence. Three more stakes winners produced by Althea are Destiny Dance (Sheepshead Bay Stakes) by Nijinsky, Alyssum by Storm Cat, and a full sister to Yamanin Paradise named Aurora. Aurora would further the family legacy when she produced Super Derby winner Arch by Kris S. Arch had been a very solid and steady sire before he died of a heart attack at his home in Claiborne Farm this past January 20. He is the sire of such notables as Blame (Breeder’s Cup Classic, Whitney Handicap), Grand Arch (Shadwell Turf Mile), Arravale (Sovereign Award Horse of the Year, E.P. Taylor Stakes), Archarcharch (Arkansas Derby), Pine Island (Alabama Stakes, Gazelle Handicap), Love Theway Youare (Vanity Handicap), as well as champions Les Arcs in England and Overarching in South Africa. Arch is also the broodmare sire of I’ll Have Another (Kentucky Derby, Preakness Stakes, Santa Anita Derby)) and current red hot first crop sire Uncle Mo (Breeder’s Cup Juvenile). Aurora also produced a stakes winning full brother to Arch in Alisios, UAE Horse of the Year in Festival Of Light by A.P. Indy, and multi stakes winner Acoma (Spinster Stakes etc) by Empire Maker. Aurora’s daughter Asian Express by Empire Maker is the dam of the fine multi stakes winning sprinter Tea Time by Pulpit. Destiny Dance is the mother of grade one stake winner Balletto (Frizette Stakes) by Timber Country, and grade three stakes winner Dearly by Rahy. Returning to our subject Courtly Dee, her next foal was non-winner Barada by Damascus, second dam to No Reason (Japanese 2000 Guineas) by Brian’s Time, and multi stakes winner Great Journey by Sunday Silence. Courtly Dee’s son Ketoh won the G1 Cowdin Stakes as a two year old but succumbed to a colon infection in April of his three year old season. Next up from Courtly Dee are daughters Maidee by Roberto and Namaqua by Storm Bird. Maidee is the dam of Defacto (Young America Breeder’s Cup Stakes) by Diesis. Namaqua produced Namaqualand (Lamplighter Handicap) by Mr. Prospector. Helen Groves, Helen Alexander, and David Aykroyd bred Courtly Dee back to Alydar and got two more fillies. In 1987 the mare produced Aishah. This full sister to Althea won the Rare Perfume Stakes and the Ocean Tide Stakes. Among the foals of Aishah are Aldiza (Go For Wand Handicap) who produced stakes winner Where’s The Moon by Malibu Moon, and Alchemist by A.P. Indy, who in turn became the dam of unbeaten Far From Over by Blame. Aisha is also the grandmother of stakes winners Pretty Katherine and Aurelia’s Belle. The other full sister to Althea is Aquilegia, winner of the Black Helen and New York Handicaps. Aquilegia has produced Bertolini (July Stakes) by Danzig. This three quarter brother to Green Desert got off to a fine start as a sire standing at Overbury Stud in Gloucestershire becoming the 2005 first crop leading sire. He moved around to various Darley Studs such as Kildangan in Ireland, Dalham Hall in Newmarket, shuttled for four years to Rich Hill Stud In New Zealand, and then on to Haras des Faunes in France, where he suffered a heart attack and died in May of 2013. Bertolini is the sire of Cheveley Park Stakes winner Donna Blini, the dam of the great Japanese mare Gentildonna by Deep Impact. Aquilegia is the dam of stakes winner Amelia (Francis A Genter Stakes) by Dixieland Band. Amelia has foaled three stakes winners including Kindergarden Kid by Dynaformer, Assateague by Stormy Atlantic, and Rainha da Bateria by Broken Vow. Another major producing daughter of Aquilegia is the Thunder Gulch mare Alittlebitearly, she the dam of Breeder’s Cup Classic winner Bayern by Offlee Wild. There would be two more foals from Courtly Dee to come, both sired by Forty Niner. The first in 1992 was the colt Twining, winner of the Peter Pan Stakes and the Withers Stakes. Sent to stud with high expectations, Twining disappointed and has subsequently moved from Kentucky, to Australia and then Japan, in search of a mare population that could work with his blood. The last foal from Courtly Dee was the 1992 filly Amizette. A non-winner, she did produce King Of Rome (Royal Whip Stakes) by Montjeu, and Super Expresso (Allaire DuPont Distaff Stakes) by Medaglia d’Oro. This is quite an extensive list of stakes winners, stake producers, and successful stakes sires emanating from one mare, and a non stakes winning mare at that. There are some highly visible names in this list such as world class horses like Golden Horn, Gentildonna, Blame, Arravale, Sea The Stars, Ouija Board, I’ll Have Another, Uncle Mo, Midday, Charm Spirit, and of course her own champion daughter Althea. All of which have the name of Courtly Dee prominent and close up in their lineage. Courtly Dee was retired from breeding, after all she did produce eighteen foals, and lived another three years. She died on August 16, 1995 in her paddock at King Ranch, the family farm of Helen Alexander. Her father was none other than Robert Kleberg, founder of the great Thoroughbred racing and breeding establishment. Legends such as Assault, Middleground, and Gallant Bloom have come from this historic farm. Helen Groves’ daughter Helen Alexander took up the day to day running of the farm during much of Courtly Dee’s historic tenure there. In the grand scheme of breeding, pedigree generally wins out. This has been proven time after time throughout history. Yes occasionally a modestly bred horse will come along and run past his or her pedigree and become a stakes winner, or even a champion. When that happens, fans are treated to the unpredictability of the marvels that is a Thoroughbred race horse. However the long term continuation of stakes winners comes predominantly from proven pedigrees. While Courtly Dee was not a great race horse, her solid and well constructed pedigree gave her the chance to become one of the great mares of the twentieth century. Just the sheer numbers of her descendants clearly point this out. Courtly Dee was a wonderful broodmare. Her gifts to the Thoroughbred world are evident all around the globe where top class horses are bred and raced. She produced eight stakes winners and several broodmare daughters which have continued on with dozens more, generation after generation. This is a legacy that still has many chapters to be written. My father, Marvin Waldman, was a long time partner of Lee Eaton’s in Courtly Dee and many other top horses. Leo, no relation, was a long time advertising manager at The Daily Racing Form. Well written, comprehensive article, Colin. My apologies to you Ric. My mistake. Thank you for the heads up. I will make the correction to give your father his due credit in Courtly Dee’s life. Hell of a mare. Wow! !